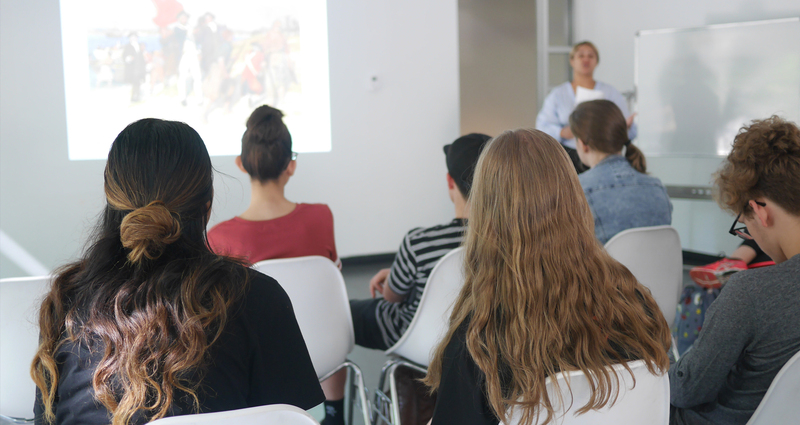 This Saturday intensive (with snacks) will equip Year 12 students with a working knowledge of key art history terms and concepts, as well as immediate applications of the conceptual framework. Drawing on works and themes in current exhibition, Borrowed Scenery the program includes practice questions based on HSC paper and an art history crash course on feminism in art. Students will be supported to extend and apply their understanding of the conceptual framework, working in the gallery with ‘real live’ works. Developing skills and confidence to articulate their own responses as audience members, students will test, discuss and map inter-relationships and agencies of the conceptual framework. This program is designed as a dynamic learning experience for keen visual arts students, using a mixture of group discussion and collaboration, direct experience and engagement with artworks, visual brainstorming as well as practice questions and take-home resources. This is part of a targeted series for Stage 6 Visual Arts students. The program includes a final weekend intensive (unseen works) in Term 3, and our major Artists & Practice day focused on BOW development for new Year 12 students in Term 4, 2019. Bookings: This is a FREE program, however places are limited . Apply online here before Monday 4 March, 2019.